I know I said that I find the task of preparing fava beans to be overly fussy, but I’ve found a way that makes it easy. Graciously agree to let a girlfriend come over on a Saturday to make lunch together, and hope that she arrives with a bright little bowl of favas that have already been shucked, boiled, and individually peeled. (Thanks, girlfriend!) If she goes on to introduce you to a gorgeous recipe like this one, that’s just icing on the cake. This is the second fava recipe I’ve posted on this site and both of them are for bruschetta. (The other bruschetta topping is a rich fava and arugula pesto.) Is this a coincidence? I think not. There’s something about a fava bean that just lends itself to being mashed up and spread on a salty little piece of toast. This approach stretches the flavor and glorious color of the favas to feed more mouths, and generously disguises the paltry yield of the original pile of beans. Plus, they’re great. The favas here are blended into a lemony, garlicky mash, which contrasts beautifully with mellow ricotta and crisp little toasts. We had these bruschetta with zucchini fritters and a tiny tomato salad made from the five little tomatoes that have ripened in my garden so far this year. Fava and Ricotta Bruschetta (adapted from Helsing Junction Farm): If a friend doesn’t do it for you, shell a pound of fava beans, cook them in boiling water for about 3 minutes, then drain them and peel each individual gosh-darn bean. Put favas in a food processor with 3 minced garlic cloves, a pinch of salt, a splash of olive oil and the juice of half a lemon, and pulse until the beans are coarsely chopped. Bake a dozen baguette slices at 375 until golden, 10-12 minutes. Rub each piece of toast with the juicy side of a cut garlic clove. Top each toast with a scoop of ricotta cheese and then a scoop of the fava beans. Drizzle lightly with olive oil if desired, then season liberally with salt and pepper. Top each bruschetta/toast/crostini/tartine with a pinch of slivered mint leaves. 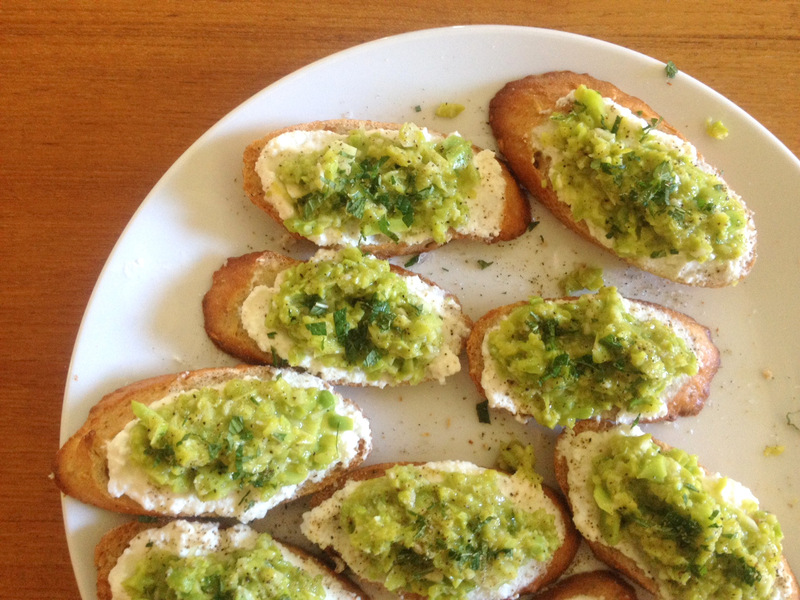 This entry was posted in Food, Recipes, Snacks and Apps and tagged cooking with friends, demanding vegetables, fava beans, fava recipe, summer CSA recipes, what is the difference between a crostini and a bruschetta anyway? on August 5, 2012 by emmycooks. My first exposure to Fava Beans and this looks like a great option for Bruschetta. This bruschetta looks so good! Wish I had a friend who would drop by with a bowl of fava beans! And for the RAWfoodists… you can do the same recipe with sprouted fava beans (which are way less fat and way more nutritives than the dry ones) and replace the ricotta by a “wet” nut cheese. This is a soooooo delicious recipe… Thank you Emma! Interesting, I wouldn’t have thought to try that! I have never tried sprouting dried favas, have you? Oh, I love fava beans!!!! Your bruschetta look amazing. I completely missed them this year :-( But I will eat vicariously through your photos and recipes! Love all kinds of bruschetta, especially when made with a friend. You’re onto something with the manual labor for Fava beans idea! I so wish somebody around here would grow favas. Goodness, yes, they are a huge pain. But so delicious! This looks like just the perfect use for them. I don’t grow them, but Alana reports that a fence-full yields enough beans for one meal. http://www.eatingfromthegroundup.com/2012/07/warm-fava-shallot-couscous/ Not efficient enough for a city garden–but maybe you have a country garden! You could also invite a friend or two and do the work together. That’s what I do when I’m making something for a dinner party that is a lot of work — like sushi or home-made tortellini.